Ms. Miriam Laird came to the United States from Lima, Peru and has been a U.S. citizen for nearly 25 years. As a stay-at-home mom for 17 years, she was actively involved in volunteer activities connected to her children. This included heavy involvement with the Parent Teacher Fellowship at St. Margaret’s Episcopal School in San Juan Capistrano as well as the National Charity League. As a volunteer, she has assisted in the planning and production of countless fundraisers and other events such as theatrical, athletic and dance performances. Ms. Laird recently decided to join the working world and feels fortunate to have become part of the Miracles for Kids team in 2010. 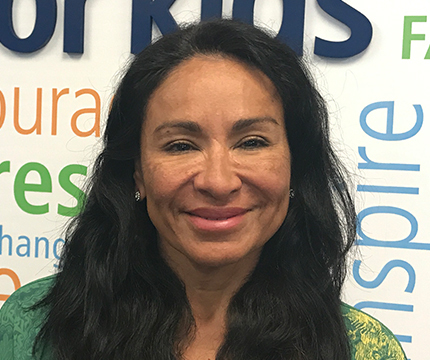 Her native Spanish-speaking abilities are a great asset to Miracles for Kids, where she currently serves as the Programs Assistant and assist as a Spanish Translator/Interpreter. She maintains regular contact and updates on the Miracles for Kids families and is responsible for interviewing them, managing patient and family files and organizing the programs that Miracles for Kids offers. Ms. Laird plays an important role by knowing the needs of our families. Ms. Laird lives in Dana Point, California and has two teenage daughters.